Ultima Thule is the first unquestionably primordial contact binary ever explored. Approach pictures of Ultima Thule hinted at a strange, snowman-like shape for the binary, but further analysis of images, taken near closest approach – New Horizons came to within just 2,200 miles (3,500 kilometers) – have uncovered just how unusual the KBO's shape really is. At 22 miles (35 kilometers) long, Ultima Thule consists of a large, flat lobe (nicknamed "Ultima") connected to a smaller, rounder lobe (nicknamed "Thule"). This strange shape is the biggest surprise, so far, of the flyby. "We've never seen anything like this anywhere in the solar system," said New Horizons Principal Investigator Alan Stern, of the Southwest Research Institute, Boulder, Colorado. "It is sending the planetary science community back to the drawing board to understand how planetesimals – the building blocks of the planets – form." This short movie shows the view of Kuiper Belt object 2014 MU69 (nicknamed Ultima Thule) as seen by NASA's New Horizons spacecraft from Dec. 7, 2018 to Jan. 1, 2019. During the approach, Ultima Thule transforms from a faint dot 20 million miles (31 million kilometers) away, indistinguishable from thousands of background stars, to a newly revealed world unlike any seen before, from a range of 5,000 miles (8,000 kilometers). The sequence consists of actual New Horizons images, taken at discrete intervals during the approach, supplemented with computer-generated intermediate frames in order to make a smooth movie. Time slows down during the movie to show clearly both the slow initial phases of the approach and the very rapid final stages. The final image (seen behind the credits) is a parting crescent view of Ultima Thule, taken 10 minutes after closest approach occurred at 12:33 a.m. EST on Jan. 1. Because it is so well preserved, Ultima Thule is offering our clearest look back to the era of planetesimal accretion and the earliest stages of planetary formation. Apparently Ultima Thule's two lobes once orbited each other, like many so-called binary worlds in the Kuiper Belt, until something brought them together in a "gentle" merger. 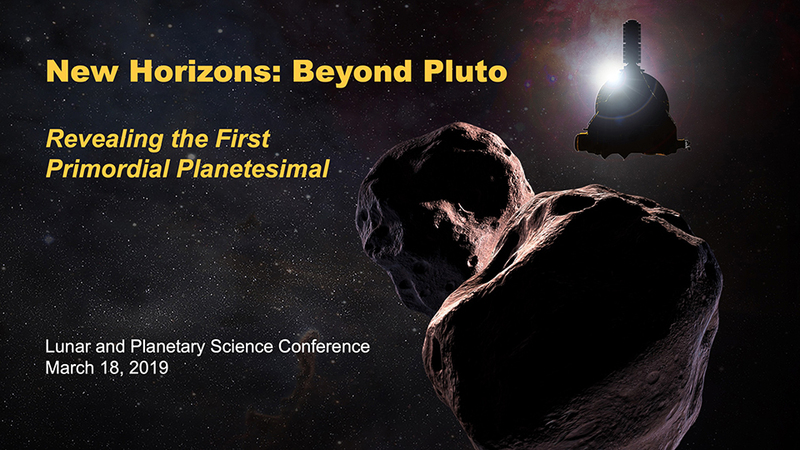 "This fits with general ideas of the beginning of our solar system," said William McKinnon, a New Horizons co-investigator from Washington University in St. Louis. "Much of the orbital momentum of the Ultima Thule binary must have been drained away for them to come together like this. But we don't know yet what processes were most important in making that happen." That merger may have left its mark on the surface. The "neck" connecting Ultima and Thule is reworked, and could indicate shearing as the lobes combined, said Kirby Runyon, a New Horizons science team member from the Johns Hopkins Applied Physics Laboratory in Laurel, Maryland. Runyon and fellow team geologists are describing and trying to understand Ultima Thule's many surface features, from bright spots and patches, to hills and troughs, to craters and pits. The craters, while at first glance look like impact craters, could have other origins. Some may be pit craters, where material drains into underground cracks, or a result of sublimation, where ice went directly from solid to gas and left pits in its place. The largest depression is a 5-mile-wide (8-kilometer-wide) feature the team has nicknamed Maryland crater. It could be an impact crater, or it could have formed in one of the other above-mentioned ways. "We have our work cut out to understand Ultima Thule's geology, that is for sure," Runyon said. "This is the first time one of these 'ultra red' objects has been explored, and our observations open all kinds of new questions," said Carly Howett, a New Horizons science team member from SwRI. "The color imaging even reveals subtle differences in coloration across the surface, and we really want to know why." New Horizons scientists have also seen evidence for methanol, water ice and organic molecules on the surface. "The spectrum of Ultima Thule is similar to some of the most extreme objects we've seen in the outer solar system," said Silvia Protopapa, a New Horizons co-investigator from SwRI. "So New Horizons is giving us an incredible opportunity to study one of these bodies up close." The Ultima Thule data transmission continues, though all of the data from the flyby won't be on the ground until late summer 2020. In the meantime, New Horizons continues to carry out distant observations of additional Kuiper Belt objects and mapping the charged-particle radiation and dust environment in the Kuiper Belt. The New Horizons spacecraft is 4.1 billion miles (6.6 billion kilometers) from Earth, operating normally and speeding deeper into the Kuiper Belt at nearly 33,000 miles (53,000 kilometers) per hour.